Me, my dogs, my life. : ten years. 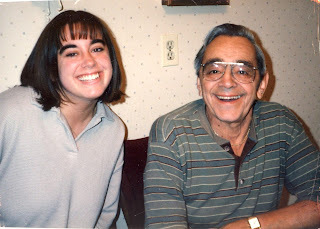 Ten years ago today my father died and changed my world forever. I know I have talked about this on my blog before and I don’t want to depress everyone, but I will just say that this has been a tremendously hard anniversary for me. For some reason, and I really cannot figure out why, it feels just as painful as it did the first anniversary (deathiversary?). I’ve had some rough days over the past month and while I thought I’d be on more solid ground by today, I just am not. And frankly, I feel a little bit stupid because ten years is a long-assed time and I should be less of a mess right now (and, really, usually I'm fine). But I’m just being honest. I'm not OK, not today. Not right now. So I will just say that I miss my dad today. Every day. I have a very strained relationship with my dad, but as a result of this post, I've talked to him each day this week. Lora - that is so awesome. I am a 30-something who loves life, who is passionate about my family, friends, dogs, theater, writing, reading, pop culture and hearing other people's stories. I think laughing is about the best thing in the world, and I would love to either live a) at the beach or b) in a bookstore. Maybe a bookstore at the beach? I'm a tomboy who loves glitter, I think caffeine is a gift from heaven, and love the fact that my daughter is as sassy as she is, even though her drama queen tendencies often remind me of her mother. What?